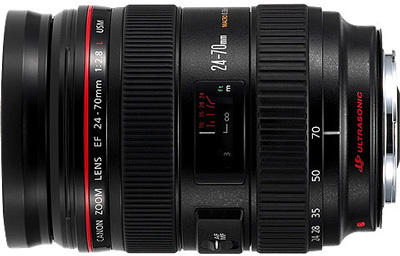 The Canon EF 24-70mm f2.8L is one of the best rated zoom lenses in Canon's lineup, superb professional lens that offers an even wider zoom range than its predecessor - the 28-70 f/2.8. This high-performance lens now features two types of aspherical elements, an entirely new UD-glass element for superb optical performance, focuses from 0.38m at all focal lengths and is now sealed against dust and moisture at the lens mount, the zoom and focus rings, and the switch plate. This is probably the best all-around, general purpose lens that will get the job done no matter what. The fast 2.8 aperture and high-speed AF makes this lens excellent even in low light situation.